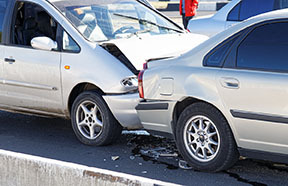 Auto accidents cost hundreds of billions of dollars each year and in some places, like New York City and Los Angeles, nearly one out of three accidents may not be an "accident" at all, according to the National Insurance Crime Bureau (NICB). In one type of fake accident, dishonest drivers maneuver innocent drivers into car crashes. While the innocent driver may sustain only minor injury or damage to their cars, fraudsters conspire with third parties such as shady health care facilities and/or their employees and garages and greatly exaggerate their claims, pocketing huge profits and inflating your insurance premiums. Typical targets for fake accidents are new, rental or commercial vehicles because they tend to be well insured. Also vulnerable are women driving alone and seniors, because they are thought to be less confrontational when involved in a collision. Panic Stop: Typically, the fraudster vehicle, usually an older car, is carrying passengers. It pulls in front of an innocent driver's car and a backseat passenger watches for the target to be distracted by something. The person in the backseat alerts the fraudster driver to slam on the brakes suddenly. The innocent driver rear-ends the fraudster's vehicle. Drive Down: The innocent driver merges into traffic after being motioned to do so by the seemingly helpful fraudster. As the innocent driver tries to merge, the fraudster speeds up and causes a collision. After the accident, the fraudster denies motioning permission to merge, insisting the target was being aggressive. A variation of this occurs when a fraudster driving down the street from the opposite direction motions a target to cross the double line into a driveway, then speeds up and hits them. Since a driver making a left turn must always yield to oncoming traffic, the innocent will be held at fault. Side Swipe: In situations where there is a dual left turn lane, the innocent driver in the inner lane is sideswiped by the fraudster in the outer lane. Swoop and Squat: Three cars are involved. The "squat" car pulls in front of the innocent's car. Suddenly, the "swoop" vehicle pulls up in front of the "squat" car and slams on the brakes, causing the "squat car" to also apply its brakes as the innocent rear ends the "squat" car. The "swoop" car drives off, but the innocent is responsible for hitting the "squat" car. A variation of the swoop-and-squat occurs on freeways, where three fraudster cars plus the innocent are involved. The same maneuver is used but the third fraudster boxes the innocent in so he can't change lanes to avoid hitting the "squat" car. Avoid tailgating at all times and focus on driving defensively. Call the police immediately to the accident scene. Document all damage with the camera on your cell phone or with a disposable camera you keep in the car in case of emergencies. Also take pictures of the occupants of the other vehicle. Obtain the names and driver's license numbers of all occupants in the other car. Take detailed notes of what exactly happened. The more information you have, the more equipped you are to fight a fraudulent claim. When possible, your notes should include driver's license numbers, car insurance information, names, addresses and phone numbers of all parties involved in a crash. Obtain the names and key information from witnesses. Report your suspicions to your insurance agent immediately. Be wary of people who suddenly appear at an accident (“runners” and "cappers"), trying to direct you to particular doctors and attorneys. Same goes for tow trucks who show up without being contacted first. Don't trust physicians who insist you file a personal injury claim after an accident, especially if you're not hurt. If you think you've been the victim of automobile insurance fraud, don't hesitate to call your agent. Are Your Jewelry Items Insured for Their True Value?